An automix composite based core material designed for the easy fabrication of core build-ups. The core material is a dual cure, fluoride releasing resin core material available in natural (A3) shade, a contrasting blue shade and opaque white. Intra oral application tips are provided for precise, direct placement of core material. 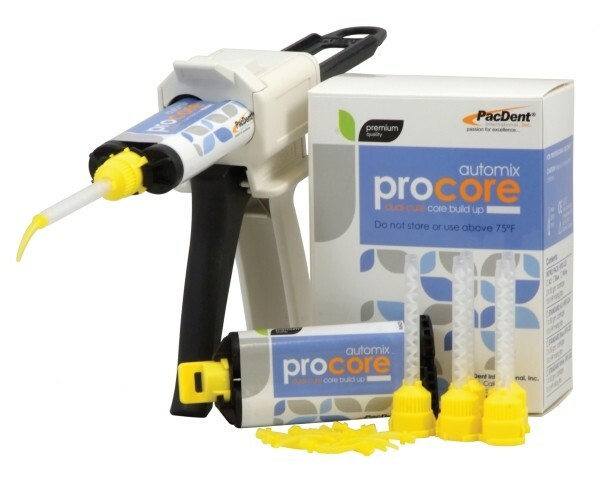 The core material releases fluoride to help reduce secondary caries. Dual curing and quick setting eliminates time consuming layering of material and allows for easy bulk fill. This material is highly radiopaque and exhibits a short setting time without high heat generation.